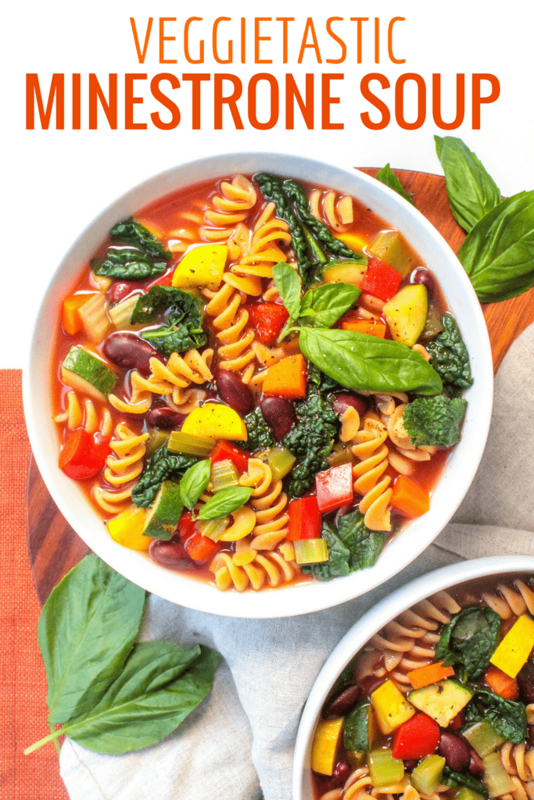 This easy recipe for a throw-together, use up whatever is in the fridge Veggie-tastic Minestrone Soup was first published in 2009. It got a photo upgrade and some additional tips and details, so I wanted to re-share the post. Enjoy! I love when I can create a balanced meal by just throwing things into a pot, and this Veggietastic Minestrone Soup lets me do just that! 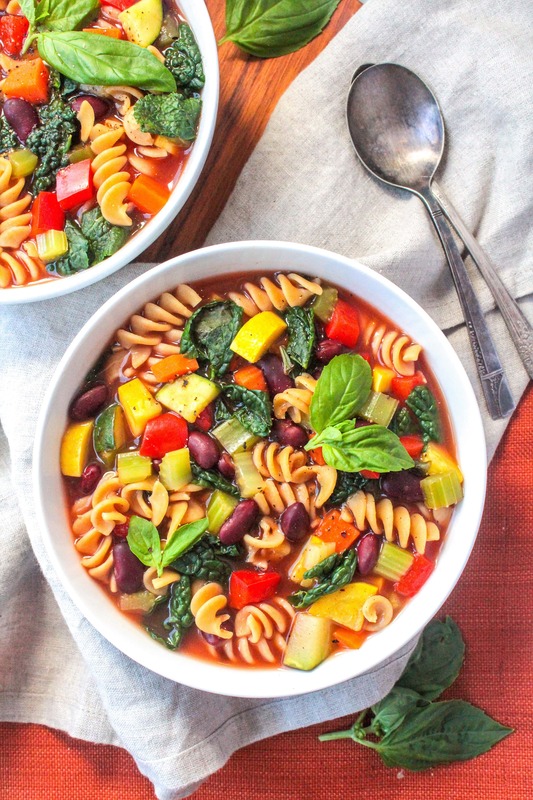 The combination of beans, whole grain pasta, and veggies makes it balanced and filling, but it’s seriously the easiest recipe to put together, and it feeds a crowd, too. 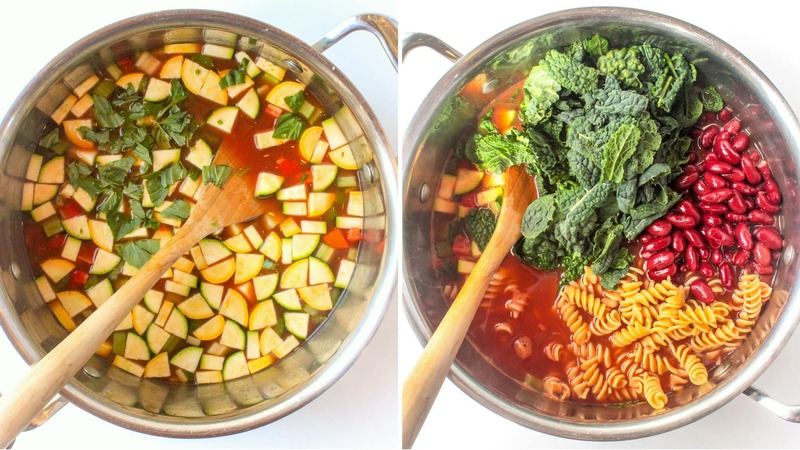 Possibly favorite thing about this soup is that it uses up leftover pasta (!!!). Seriously, does anyone know how to make an appropriate amount of pasta? I always cook wayyy too much and then I end up trying to figure out how to eat it for days. So if you’re like me, recipes that use up leftover pasta are a big deal. 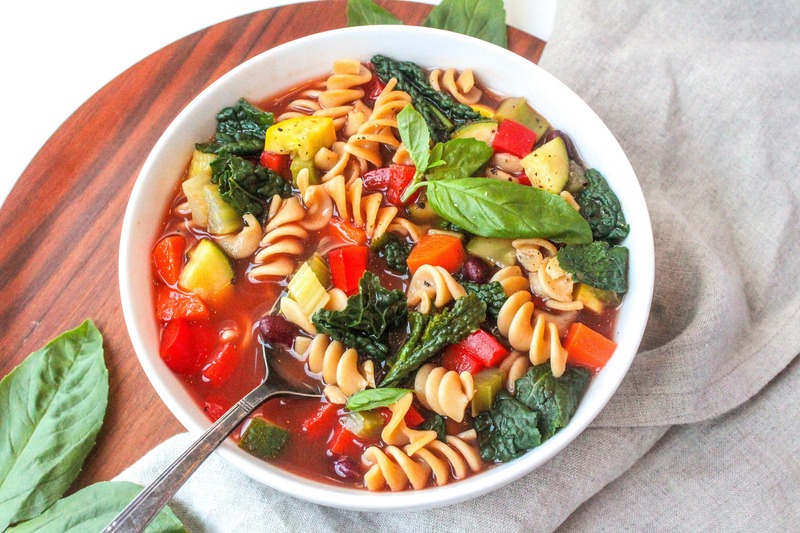 And when I say this minestrone is easy to make, I mean it’s really easy. If you want, you can sautee some garlic and onions in a pan until fragrant and then add the other ingredients – or feel free to skip that and just bring vegetable broth, water, tomato sauce, and whatever veggies you have on hand to a simmer and cook for a few minutes. Stir in beans, cooked pasta, and greens, et voila – you’ve got dinner! A tip: if you’re not going to eat it all in one sitting, I’d suggest keeping the pasta separate – just add it right before serving. That way it won’t get soggy! I love how flexible this recipe is. Just about any veggie will work, so feel free to throw in fresh veggies that are sitting in the back of the fridge, frozen veggies, or anything else you have around – you can never have too many veggies in here! You can also add some ground meat in if you want – just saute it until cooked through, then toss it into the soup. Here’s the full recipe – Enjoy! Add the veggie broth, tomato sauce, water, veggies, and basil to a large pot. Bring to a boil, then reduce heat and simmer for 7-10 minutes, until veggies are tender. Add the beans, pasta, and salt and pepper to taste. If you're using greens like kale or spinach, add them in now too. Stir and let heat through, then serve! Looking for more quick and easy dinner recipes? Here are some of my favorites! Yum. 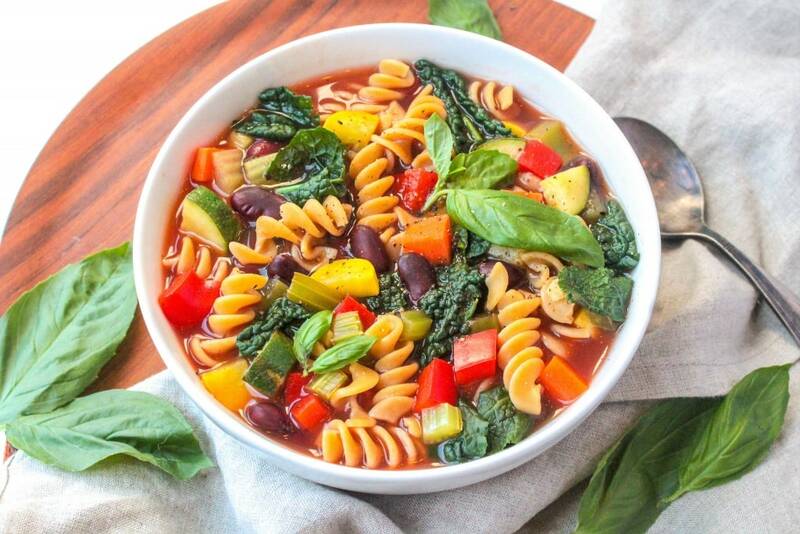 I love a good healthy minestrone. I never order it out though because restaurants have a habit of making the worst for you dishes, but this sounds delicious. I’m impressed! Btw, do you realize you wrote “VIOLA” instead of “VOILA”? hehehe… sorry you know i had to. It was so windy in Boston yesterday too! I LOVE butternut squash soup. 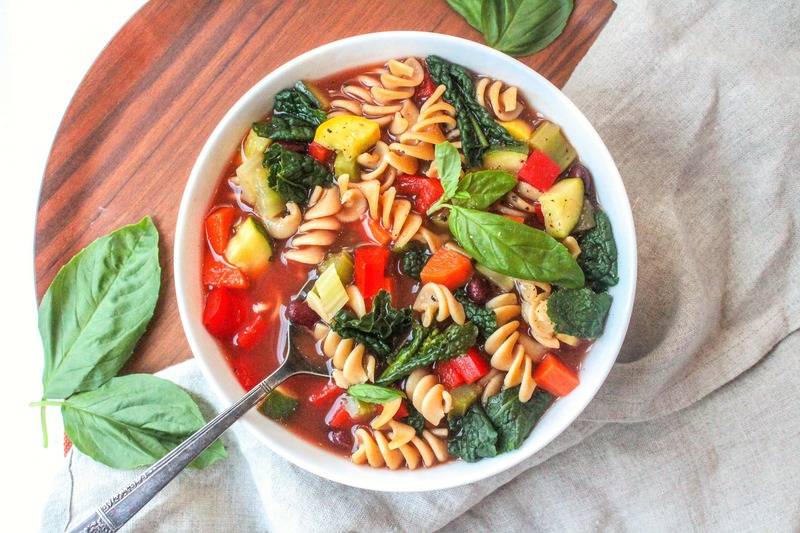 Delicious looking soup, it looks pretty simple too.. a winning combination! My fav soup is the all original tomato soup, just can’t get enough of it. It was really windy in Charlotte yesterday too, I felt like I was going to blow over at one point. Hope you enjoy your day! Ooh, my favorite soup ever! I’m so that kind of person that tosses whatever pasta I have left but I’m gonna save it next time to make some minestrone! Reminds me of yummy soup in florence! sigh! Can you use chicken broth if you don’t have veggie broth? I don’t care about it being vegan. Love it that it is so easy and inexpensive besides healthy! Looks delicious!!!! I love using dark green veggies in soup adds just something extra and looks beautiful! That looks fantastic, and I’ll bet it is very tasty. Thanks!